Congratulations to Brett Shaffer, Winner of Event #53: $1,500 No-Limit Hold'em ($665,397)! After four days of poker, Event #53: $1,500 No-Limit Hold'em now has a champion with Brett Shaffer collected his first WSOP bracelet and $665,397 in prizemoney. 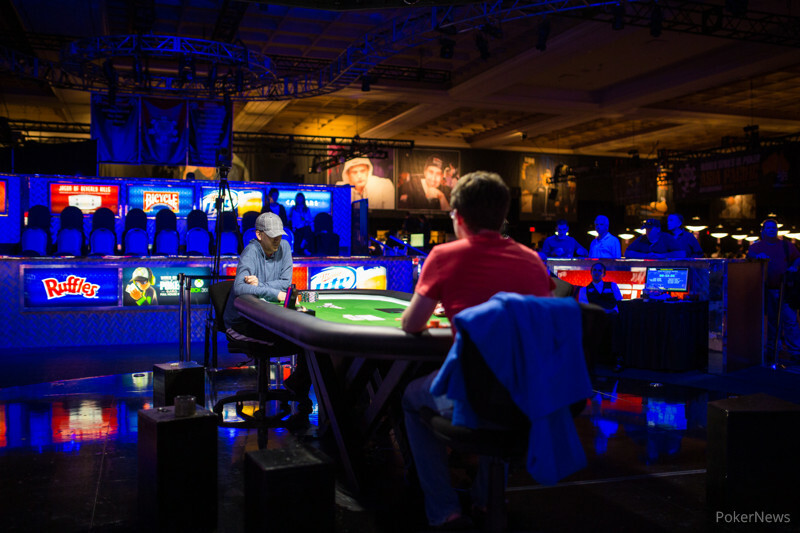 What started on Saturday with a mammoth 2,816 players was slowly whittled down day-by-day until we reached a final table of nine early yesterday afternoon. Expecting to crown a winner late in the day, the final table was off to a quick start as we lost Matias Ruzzi, Darren Rabinowitz, Jonathan Cohen and Diego Zeiter all in the first 23 hands. 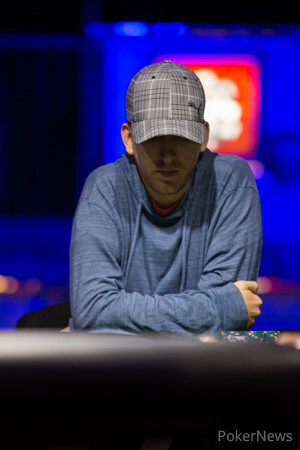 However the five-handed battle would be a tough one with nearly each of the players holding onto the chip lead at one point as Canadian Mike Watson led the five at dinner break. Once play recommenced, it would be Shaffer's turn in taking the chip lead after he peeled with a gunshot that spiked on the river against Watson. However Shaffer would relinquish that lead to the only female to make two final tables in Loni Harwood who four-bet shoved with and had Shaffer tank-call with to find a double. Watson would then run deuces into queens before falling in 4th as the final four would be lead by Arttu Raekorpi as they went on the final break for the evening. Unfortunately for Harwood, she wouldn't be the first female bracelet winner this year as she exited in 4th place after shoving into Vamplew's . As we entered the final level of play it would be Vamplew getting lucky to take a huge chip lead after shoving into Raekorpi's . Vamplew however would then be on the losing end of a dominated flip when Shaffer cracked his with before play ended for the night with Vamplew and Shaffer neck-and-neck as Raekorpi rounded out the rear. Once play recommenced today, Raekorpi would last just four hands before falling in 3rd as Shaffer took s chip lead into heads up play that was virtually the size of the small blind. Vamplew took the lead early, but Shaffer snatched it back before extending it further and further to hold a two-to-one advantage. After 23 hands of heads up play and 201 hands at the final table, the final hand would see Vamplew snap-call Shaffer's three-bet shove with but be unable to hold against Shaffer's when he flopped top two pair to see the young Scottish player earn his second 2nd place finish of the series. Congratulations to Brett Shaffer on winning Event #53: $1,500 No-Limit Hold'em! Shaffer displayed great patience, timing and hand-reading abilities to capture his first WSOP gold bracelet and $665,397 in prizemoney. From the PokerNews live reporting team, thanks for following along with all the Event #53 action, and make sure to catch all the updates from any of the other four events being played out today right here! David Vamplew Eliminated in 2nd Place ($413,157); Brett Shaffer Wins! Hand #201: David Vamplew opened to 400,000 from the button and Brett Shaffer moved all in for just over 8.3 million. Vamplew instantly called for his remaining 3,935,000 in chips and the cards were tabled. With Vamplew in the lead and looking to double through to a two-to-one advantage, the flop gave Shaffer the commanding lead with top two pair. As Vamplew's rail that was full of British and other European players stood to their feet, they repeatedly called for the before the dealer delivered the on the turn. "Queen of f**king spades one time!" screamed one of Vamplew's rail birds, but as the dealer dropped the on the river, Vamplew would have to settle for his second 2nd place for the series which sees him earn $413,157 for his efforts. Hand #198: Brett Shaffer limped and David Vamplew checked to see a flop. Vamplew led for 200,000 and Shaffer folded. Hand #199: David Vamplew raised to 400,000 from the button and after a minute in the tank, Brett Shaffer pushed all in for roughly 8 million. Vamplew folded and Shaffer was pushed the pot. 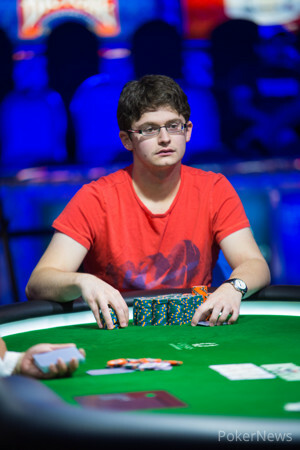 Hand #200: David Vamplew receives a walk in the big blind. Hand #193: David Vamplew opened to 320,000, which was enough to take down the pot. Hand #194: Brett Shaffer called the big blind, and Vamplew checked his option, before the flop came down . Vamplew bet out 180,000, which saw a fold from his opponent shortly after. Hand #195: Vamplew opened to 320,000, and collected the small blind and antes. Hand #196: Shaffer opened to 320,000 and was snap called, as both players saw the flop come . Vamplew checked his option, as did Shaffer, before the fell on the turn. Vamplew then reached for chips, and slid out 300,000, which was called, as the completed the board. Vamplew paused for a moment, before checking over to Shaffer, who checked shortly after. Vamplew turned over his qc4c for queen-high, before Shaffer tabled his 8c8h, which was enough to take down the pot. Hand #197: Vamplew opened to 320,000, and was called by Shaffer, as the flop came . Both players checked, as the fell on the turn, before doing the same, as the completed the board. Shaffer checked for the third time, before Vamplew quickly bet out 375,000, which was called shortly after. Vamplew turned over his cards, and had the for the flush, before Shaffer tabled his cards revealing the for the higher flush, which took down the pot. Hand #189: David Vamplew raised to 320,000 from the button and Brett Shaffer called to see a flop fall. Shaffer led for 325,000 but Vamplew pushed out two stacks of chips amounting to a 800,000-chip raise. Shaffer dipped into the tank for close to five minutes before moving all in to prompt an insta-fold from Vamplew. 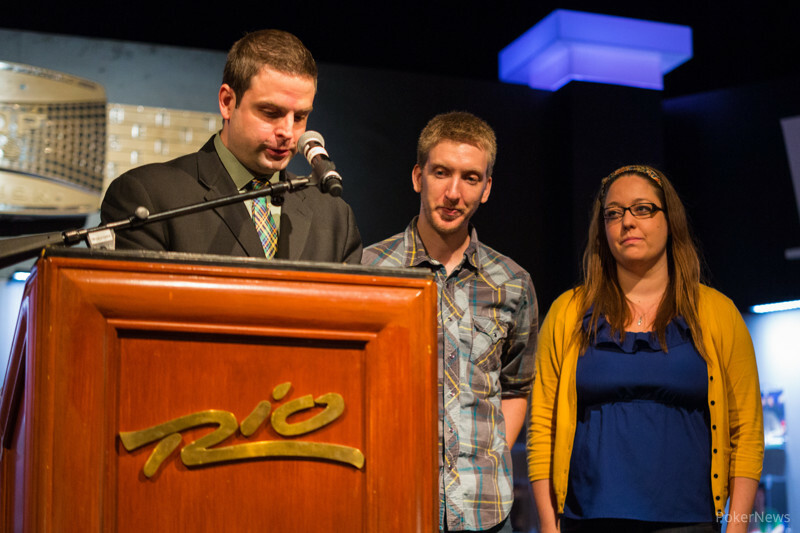 Hand #190: Brett Shaffer raised to 320,000 and collected the big blind and antes. Hand #191: David Vamplew raised to 320,000 and collected the big blind and antes. Hand #192: Brett Shaffer raised to 320,000 and David Vamplew made the call to see a flop fall. 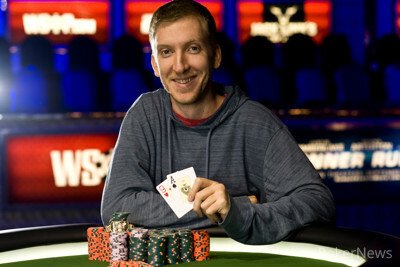 Shaffer continued for 325,000 and won the pot. Brett Shaffer opened to 320,000, and was snap called by David Vamplew, before the flop came down . Vamplew checked his option, as did Shaffer, before the fell on the turn. Vamplew reached for chips, and bet out 320,000, which was enough to take down the pot. Vamplew opened to 320,000, before Shaffer opted to raise to 650,000. Vamplew quickly made the call, before the flop came down . Both players checked, as the fell on the turn. Another set of checks followed, as the completed the board. Shaffer tabled his for a pair, which was enough to take down the pot, as Vamplew mucked his hand. Shaffer opened to 320,000, which was called by Vamplew. The flop came down , as Vamplew slid out a bet of 400,000. Shaffer sat motionless for several minutes, tanking over his decision. He eventually folded his hand, giving Vamplew the pot. Hand #182: From the button Brett Shaffer raised to 320,000 and David Vamplew called to see a flop fall. Vamplew checked and Shaffer announced a bet of 325,000 which Vamplew called as the landed on the turn. Vamplew checked again and Shaffer went into the tank for a minute before cutting out a bet of 600,000 to force a quick fold from Vamplew. Hand #183: David Vamplew opened to 320,000 from the button and won the blinds and antes. Hand #184: Brett Shaffer limped in from the button and David Vamplew exercised his option with a check to see the dealer spread a flop. Both players checked as the landed on the turn and Vamplew led for 180,000 before Shaffer bumped it up to 525,000. Vamplew paused for a few moments before releasing his hand. Hand #185: David Vamplew opened to 320,000 and Brett Shaffer went into the tank for nearly two minutes before making the call as the flop was spread by the dealer. Shaffer checked and Vamplew bet 275,000 which was responded by a fold from Shaffer. David Vamplew opened to 320,000, which forced a fold from Brett Shaffer. Shaffer opened to 320,000, before Vamplew raised it up to 750,000. Shaffer thought about his decision for nearly three minutes, before just opting to make the call. 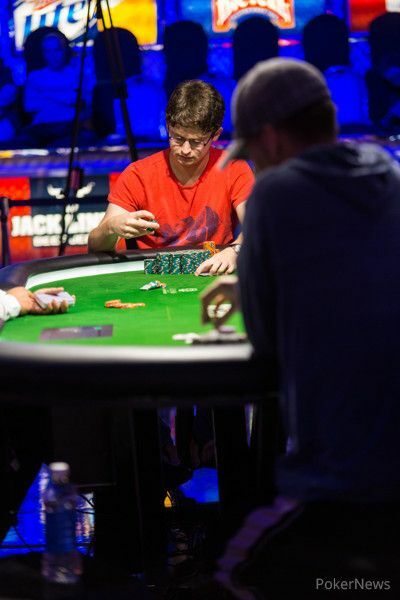 The flop came down , as Vamplew quickly reached for his chips, and placed out a continuation bet of 620,000. Two more minutes passed, before Shaffer opted to muck his hand, relinquishing the pot to Vamplew. Vamplew opened to 320,000, before Shaffer re-raised all in. Vamplew quickly mucked, as Shaffer got some chips back.